From now until December 3rd we’re trialing two new databases at Xwi7xwa Library: Ancestry Library Edition and Ethnic NewsWatch. Ancestry library Edition is a partnership between ancestry.com and ProQuest, and offers a wealth of genealogical resources from the United States and the United Kingdom, alongside record collections from Canada, Europe, Australia and other countries. You can access Ancestry Library Edition through the UBC Library Index and Database collection, or find a research guide for the databases here. We’d really appreciate your feedback on this resource, which you can give in person or by following this link. Ethnic NewsWatch offers coverage of grassroots, community, and independent press publications and is particularly valuable as a source of Indigenous newspapers and newsletters. It is an older database, as you might notice from the terminology and metadata it uses, but is still being updated with new issues of community-led and small press Indigenous publications. 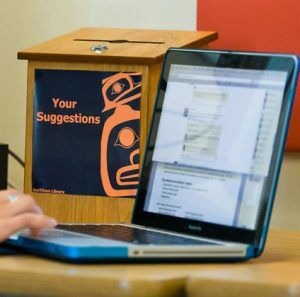 You can access and explore Ethnic NewsWatch through the UBC Library Index and database collection, or visit ProQuest’s research guide for further information. Once again, we welcome and feedback on both the contents and the experience of using the resource, either in person or through the feedback form. We’re running these trials to see how these resources might fit your needs and the needs of our collection at Xwi7xwa, so please get in touch and let us know what you think.